Vespa Club Mantova, with the support of the Municipality of Mantua, in collaboration with: Vespa Club d'Italia, Italian Sports and Social Associations (acronym ASI – specifically indicated as MOTO ASI), Vespa World Club, Vespa Historical Register, Vespa Club Forlì, Vespa Club Perugia, Vespa Club Vespa nel Tempo - Rome, Vespa Club Viterbo and Vespa Club Mugello, will organize, on the 26th, 27th and 28th of May 2017, the 13th Edition of the 1000km Vespistica. For the first time, in the history of this event, the 1000 Km will arrive in Rome. 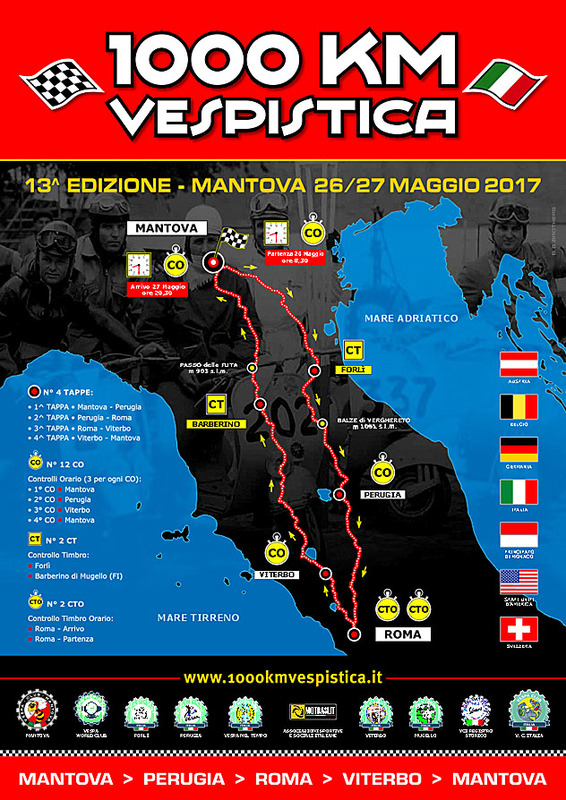 As in previous editions, the aim is to re-launch the "manifestation" that has been more than any other and is the symbol of Italian and international Vespa events where the combination of vintage and modern, sports and tourism commits vehicles and riders in a challenge first and foremost with riders themselves and then with the stopwatch. The recommendation that we propose, besides the usual driving with caution, is to carefully prepare your beloved Vespa and read carefully the Official Rules 2017 Vers. 1.3, the technical information and advice that will be published on the web site in the next few days. Safe driving to each and everyone.